SOLD OUT – Noted textile collage artist Elaine O’Neil has once again partnered with UNC Lineberger to create a beautiful 2019 calendar! All artwork © 2018 Elaine O’Neil, used with permission. Elaine O’Neil creates each image using myriad fabric colors and textures, all painstakingly sewn together to create whimsical and realistic portrayals of scenes from the mountains to the coast. 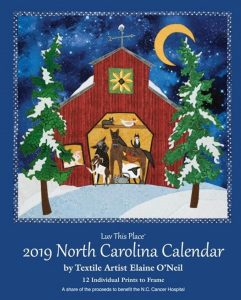 Her high-quality art calendars make a great gift for anyone who loves the natural beauty and distinctive features of North Carolina – whether they live here or are far from home. Your purchase supports programs at the N.C. Cancer Hospital, the state’s only public cancer hospital. O’Neil graduated from Philadelphia College of Textiles and Science, earning a BS degree in textile design. She is great-granddaughter to a lighthouse keeper, granddaughter to a farmer, daughter of an ardent seamstress, and mother to three sons. O’Neil’s ties to her past are ever present. Her work has been featured and exhibited in galleries from the coast of Maine to midtown Manhattan to shops in the Appalachian mountains of North Carolina.